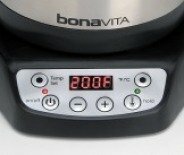 Bonavita BV382510V Electric Kettle, Gooseneck Variable Temperature, 1. - Sportland Tea Co. 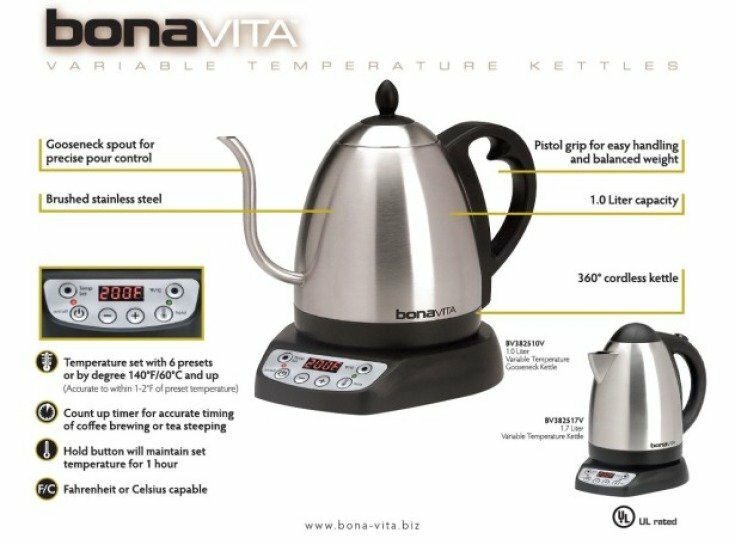 The Bonavita Variable Temperature Electric Kettle is a 1.0 liter capacity stainless steel kettle with many unique features. Users can select from six present temperatures or can set their own temperature from 140 degrees F (60 degrees C) and up. The 1000 watt heater boils water quickly and will hold the set temperature for up to one hour. The kettle has a unique spout that allows for a very controlled water pour that is needed for manual brewing of coffee and great for tea steeping as well. Our kettles have been used by World and US Champion Baristas based on its build quality and pour control. Unique spout for pour control. 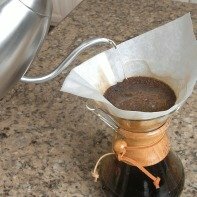 Use for manual coffee brewing, tea, or your favorite hot beverage. 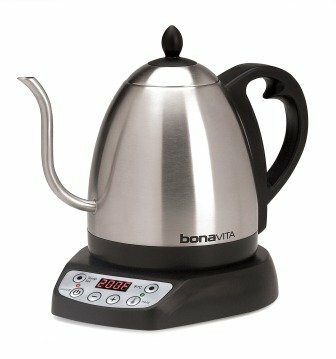 The Bonavita BV382510V Variable Temperature Electric Kettle is fully UL Certified for safety compliance and features a 1-year manufacturer's warranty.